These errors typically occur if there's a problem with your NOOK's authorization. You should be able to fix the issue by resetting the Adobe credentials on your NOOK using a computer. Note: These steps don't work for the NOOK GlowLight Plus, which is authorized differently than other NOOKs. 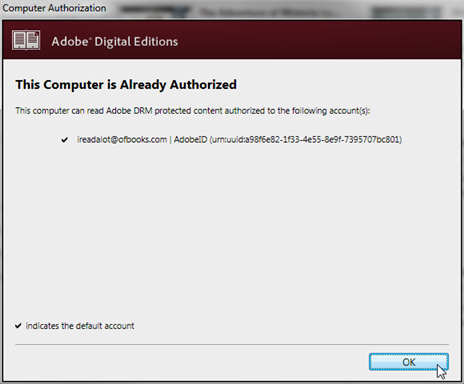 Note: We recommend always using the latest version of Adobe Digital Editions (ADE). Open Adobe Digital Editions (ADE). 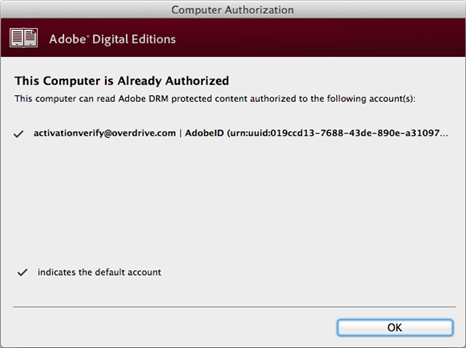 Make sure your computer is authorized with an Adobe ID or an OverDrive account. In ADE, go to Help > Authorization Information. Note: If this option is grayed out, please authorize your computer before continuing. The authorization window will open and show you what credentials you're currently using for your computer. Close ADE and wait a few moments. Reset the ADE folder on your NOOK. Go to [My] Computer and open the drive associated with your device (likely named Device (X:), where X is the drive letter). Locate the .adobe-digital-editions folder and delete it. Open ADE, then try transferring the ebook again. You may need to disconnect and reconnect your NOOK for it to appear in ADE. After the transfer, disconnect your NOOK. You should now be able to read the ebook on your device. The authorization window will open and show you what credentials you're currently using on your computer. Open your NOOK from Finder. 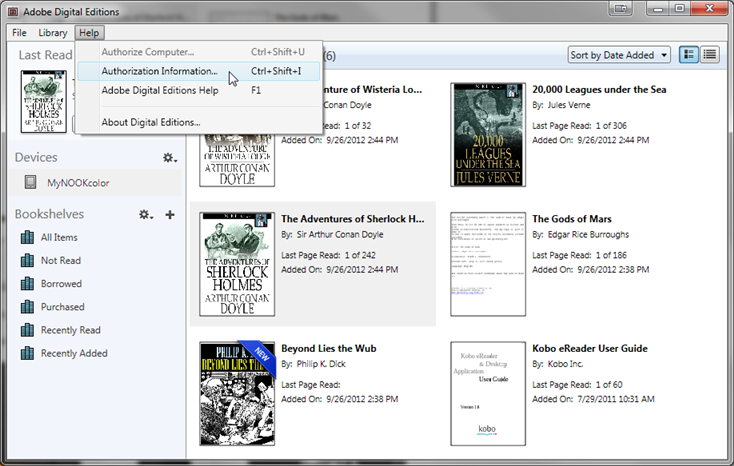 Move the contents of the "Digital Editions" folder to the trash.